Distribution in Turkey: Eastern Mediterranean, South-east Anatolia. Distribution in the world: The Blue Pansy is a widespread species, ranging from Middle East, Central Africa, South Africa, Madagascar, South East Asia, Far East Asia, Oceania. Living Area: Warm tropical climates. Road edges, water edges, fields, vineyards, gardens ..
Food Plants of the caterpillar: The caterpillar is known to feed on the leaves of Asystasia gangetica (Acanthaceae). Description-Notes: Typical area," Equatorial tropical region." Blue Pansies fly swiftly, usually over short distances, interspersed with short periods spent basking on the ground or on foliage. This butterfly is a Nymphalid butterfly with many subspecies occurring from Africa, through southern and south-eastern Asia, and in Australia. 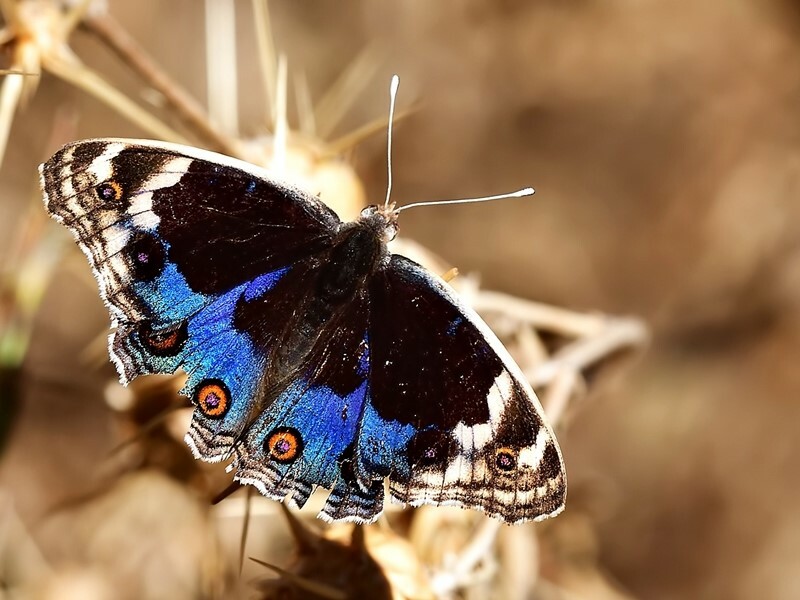 In India its common English name is the Blue Pansy, but in southern Africa it is known as the Eyed Pansy as the name Blue Pansy refers to Junonia oenone. In Australia this butterfly is known as the Blue Argus, but this name also is used for the Aricia anteros in Europe.（Wikipedia). Has rapid gliding flight.The male of this beautiful Nymphalid butterfly has velvety black fore wings ; the inner half has two orange-and-blue bands ; the outer half his brown with two orange eyespot with black centers toward outer edges. The hind wing is bright blue with a small area of velvety back at the base ; there is a large orange eyespot and a smaller black spot. The edges of both fore and hind wings show two thin black lines. The underside is marbled shades of brown with two prominent eyespot. The female is similar to the male but larger and duller. Origin of name: Orithyia: Orithyia (/ɒrɨˈθaɪ.ə/; Greek: Ὠρείθυια Ōreithuia; Latin: Ōrīthyia) was the daughter of King Erechtheus of Athens and his wife, Praxithea, in Greek mythology. Endangerment factors : Not at risk. Despite that the wings are a little damaged it is a wonderful capture. The details and colors are amazing. Lovely capture of this veteran Blue Pansy, Seyfi. Details and colours on the wings are just perfect.